Area: 110,860 sq. km. (44,200 sq. mi. ); slightly smaller than Pennsylvania. Cities: Capital: Havana (pop. 2 million). 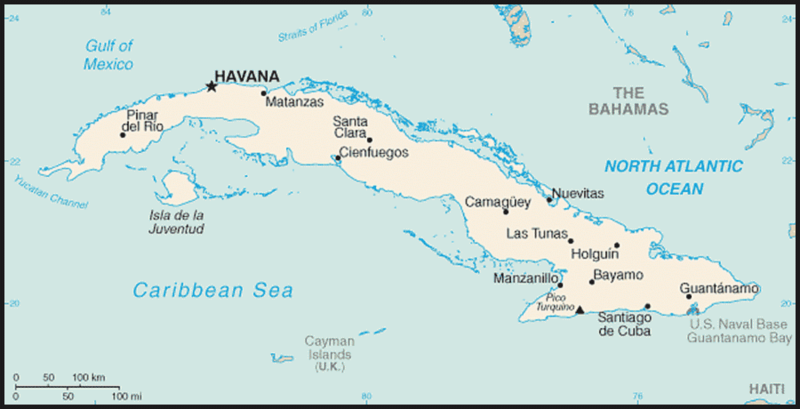 Other major cities — Santiago de Cuba, Camaguey, Santa Clara, Holguin, Guantanamo, Matanzas, Cienfuegos, Pinar del Rio. Terrain: Flat or gently rolling plains, hills; mountains up to 2,000 meters (6,000 ft.) in the southeast. Climate: Tropical, moderated by trade winds; hurricane season (August-November); dry season (November-April); rainy season (May-October). Population (official 2010 statistics): 11.2 million; 76% urban, 24% rural. Ethnic groups (official 2002 Cuba census): 65% white, 25% mixed, 10% black. Language: Spanish. Literacy (25 years and older; Cuban Government sources) — 99.8%. Work force (5.07 million): Services (including education, health and social services) — 42%; agriculture — 19%; commerce and tourism — 12%; industry — 11%; transport, storage, and communications — 6%; construction — 5%; mining, electricity, gas and water — 2%. Type: Totalitarian communist state; current government assumed power by force on January 1, 1959. Political party: Cuban Communist Party (PCC); only one party allowed. Administrative subdivisions: 16 provinces, including the city of Havana, and one special municipality (Isle of Youth). GDP (official 2010 statistics, based on constant 1997 prices): $51.01 billion. Real annual growth rate: 3.2% (2001); 1.4% (2002); 3.8% (2003); 5.8% (2004); 11.2% (2005); 12.1% (2006); 7.3% (2007); 4.1% (2008); 1.4% (2009); 2.1% (2010). GDP per capita income (2010 est., based on constant 1997 prices): $4,545. Natural resources: Nickel, cobalt, iron ore, copper, manganese, salt, timber, oil, natural gas. Agriculture: Products: sugar, citrus and tropical fruits, tobacco, coffee, rice, beans, meat, vegetables. Industry: Types: sugar and food processing, oil refining, cement, electric power, light consumer and industrial products, pharmaceutical and biotech products. Trade: Exports (2009): $2.88 billion f.o.b. : nickel/cobalt, oil and oil derivatives, pharmaceutical and biotech products, sugar and its byproducts, tobacco, seafood, citrus, tropical fruits, coffee. Major export markets (2009) — Venezuela $533 million (19%); China $517 million (18%); Canada $434 million (15%); Netherlands $237 million (8%); Spain $155 million (5%); Russia $88 million (3%); Brazil $69 million (2%); Netherlands Antilles $59 million (2%); France $45 million (2%); others $742 million (26%). Imports (2009) — $8.91 billion f.o.b. : petroleum, food, machinery, chemicals. Major import suppliers (2009) — Venezuela $2.6 billion (29%); China $1.17 billion (13%); Spain $753 billion (8%); United States $675 million (8%); Brazil $509 million (6%); Italy $324 million (4%); Mexico $303 million (3%); Canada $292 million (3%); Vietnam $276 million (3%); Germany $275 million (3%); others $1.7 billion (19%). Cuba has two currencies in circulation: the peso (CUP), and the convertible peso (CUC), both of which are fixed by the government. The CUC is fixed at 1:1 with the U.S. dollar, and 24:1 with the Cuban peso (CUP). State enterprises, however, must exchange CUP and CUC at a 1:1 ratio, an artificial rate that hinders domestic fiscal accounting. The Cuban Government levies a penalty of 10% on CUC-U.S. dollar transactions. Official statistics are available from the Cuban Office of National Statistics. For alternative statistics, see the Economist Intelligence Unit (http://www.eiu.com/). Cuba is a multiracial society with a population of mainly Spanish and African origins. Cuba was officially an atheist state from 1959 until a constitutional change in 1992 abolished atheism as the state creed and provided for the separation of church and state. At that time, the Communist Party also lifted its ban on members with religious beliefs. The largest organized religion is the Roman Catholic Church, but evangelical protestant denominations continue to grow rapidly. Baptists, Methodists, Jehovah's Witnesses, and Pentecostal churches are some of the largest Protestant denominations. Afro-Cuban religions, a blend of native African religions and Roman Catholicism, are widely practiced. There are also small groups of Jews and Muslims. See the Department's report (http://www.state.gov/j/drl/irf/rpt/) on international religious freedom for further information regarding religion in Cuba. Spanish settlers established the raising of cattle, sugarcane, and tobacco as Cuba's primary economic pursuits. As the native Indian population died out, African slaves were imported to work the ranches and plantations. Slavery was abolished in 1886. Cuba was the last major Spanish colony to gain independence, following a lengthy struggle begun in 1868. Jose Marti, Cuba's national hero, helped initiate the final push for independence in 1895. In 1898, the United States entered the conflict after the USS Maine sank in Havana Harbor on February 15 due to an explosion of undetermined origin. In December of that year, Spain relinquished control of Cuba to the United States with the Treaty of Paris. On May 20, 1902, the United States granted Cuba its independence but retained the right to intervene to preserve Cuban independence and stability in accordance with the Platt Amendment. In 1934, the Platt Amendment was repealed. The United States and Cuba concluded a Treaty of Relations in 1934 which, among other things, continued the 1903 agreements that leased the Guantanamo Bay naval base to the United States. Independent Cuba was often ruled by authoritarian political and military figures who either obtained or remained in power by force. Fulgencio Batista, an army sergeant, organized a non-commissioned officer revolt in September 1933 and wielded significant power behind the scenes until he was elected president in 1940. Batista was voted out of office in 1944 and did not run in 1948. Both those elections were won by civilian political figures with the support of party organizations. Running for president again in 1952, Batista seized power in a bloodless coup 3 months before the election was to take place, suspended the balloting, and began ruling by decree. Many political figures and movements that wanted a return to the government according to the constitution of 1940 disputed Batista's undemocratic rule. On July 26, 1953, Fidel Castro, who had been involved in increasingly violent political activity before Batista's coup, led a failed attack on the Moncada army barracks in Santiago de Cuba in which more than 100 died. After defending himself in a trial open to national and international media, he was convicted and jailed, and subsequently was freed in an act of clemency, before going into exile in Mexico. There he organized the "26th of July Movement" with the goal of overthrowing Batista, and the group sailed to Cuba on board the yacht Granma, landing in the eastern part of the island in December 1956. Batista's dictatorial rule fueled increasing popular discontent and the rise of many active urban and rural resistance groups, a fertile political environment for Castro's 26th of July Movement. Faced with a corrupt and ineffective military — itself dispirited by a U.S. Government embargo on weapons sales to Cuba — and public indignation and revulsion at his brutality toward opponents, Batista fled on January 1, 1959. Although he had promised a return to constitutional rule and democratic elections along with social reforms, Castro used his control of the military to consolidate his power by repressing all dissent from his decisions, marginalizing other resistance figures, and imprisoning or executing thousands of opponents. An estimated 3,200 people were executed by the Cuban Government between 1959 and 1962 alone. As the revolution became more radical, hundreds of thousands of Cubans fled the island. Castro declared Cuba a socialist state on April 16, 1961. For the next 30 years, Castro pursued close relations with the Soviet Union and worked to advance the geopolitical goals of the Soviet Union, funding and fomenting violent subversive and insurrectional activities and participating in foreign interventions until the demise of the U.S.S.R. in 1991. Relations between the United States and Cuba deteriorated rapidly as the Cuban Government expropriated U.S. properties and moved toward adoption of a one-party communist system. In response, the United States imposed an embargo on Cuba in October 1960, and, in response to Castro's provocations, broke diplomatic relations on January 3, 1961. Tensions between the two governments peaked during the October 1962 missile crisis. Cuba is a totalitarian communist state headed by General Raul Castro and a cadre of party loyalists. Castro replaced his brother Fidel Castro as chief of state, president of Cuba, and commander-in-chief of the armed forces on February 24, 2008. The first Communist Party Congress (CPC) since 1997 was held in April 2011, where Raul Castro was officially named first secretary of the Communist Party. He announced that 80-year-old Jose Ramon Machado Ventura would remain second-in-charge and Vice President Ramiro Valdes would remain as number three. The CPC also marked Fidel Castro's formal resignation from official responsibilities within the party, although he will likely remain an important symbolic figure. Also proposed at the congress were two 5-year term limits for top party and government positions, but the party will not take up the issues of succession and its role in government again until January 2012, when it will hold a smaller party conference. The Cuban Government seeks to control most aspects of Cuban life through the Communist Party and its affiliated mass organizations, the government bureaucracy, and the state security apparatus. The Ministry of Interior is the principal organ of state security and control. According to the Soviet-inspired Cuban constitution of 1976, the National Assembly and its Council of State have supreme authority. Since the National Assembly meets only twice a year for a few days each time, the 31-member Council of State wields power. A Council of Ministers, through its nine-member executive committee, handles the administration of the economy, which is state-controlled except for a small private market sector. Raul Castro is President of the Council of State and Council of Ministers, and Jose Ramon Machado Ventura serves as First Vice President of both bodies. In total, there are five Vice Presidents in the Council of State and seven in the Council of Ministers. Although the constitution theoretically provides for independent courts, it explicitly subordinates them to the National Assembly and to the Council of State. The Supreme Court is the highest judicial body. Due process is routinely denied to Cuban citizens, particularly in cases involving political offenses. The constitution states that all legally recognized civil liberties can be denied to anyone who opposes the "decision of the Cuban people to build socialism." The Communist Party is constitutionally recognized as Cuba's only legal political party. The party monopolizes all government positions, including the Council of State and judicial offices. Though not a formal requirement, party membership is a de facto prerequisite for high-level official positions and professional advancement in most areas. A small number of non-party members have been permitted by the controlling Communist authorities to serve in the National Assembly. The Communist Party through its front organizations approves candidates for all elected offices. Citizens do not have the right to change the government. Cuba is a signatory to the Universal Declaration of Human Rights (UDHR) and sits on the UN Human Rights Council. In February 2008, Cuba signed the International Covenant on Civil and Political Rights and the International Covenant on Economic, Social, and Cultural Rights, but has yet to ratify either document. In spite of this, Cuba places severe restrictions on many of the rights described in the UDHR and continues to engage in harassment, surveillance, arbitrary detention, and imprisonment of peaceful human rights activists and political opponents. In 2010 and 2011, Cuba freed dozens of political prisoners, including those arrested during a crackdown in 2003 known as the "Black Spring." Most of the releases were conditioned on the immediate departure of the prisoners for third countries, although a few have been allowed to remain in Cuba. Since the government does not allow international monitoring of its prisons and does not release information about the prison population, it is difficult to accurately count the number of political prisoners in Cuba. Estimates from human rights groups range from as low as 30 to more than 100. In addition, human rights groups have noted that while the number of political prisoners has decreased, the number of short-term detentions (typically aimed at disrupting planned civil society activities) increased significantly in 2010 and 2011. The law subordinates freedom of speech, freedom of the press, and freedom of assembly to the aim of building a "socialist society." Criticism of national leaders can lead to imprisonment. The government maintains complete control over all forms of mass media, including newspapers, radio and television. The Communist Party, enshrined in the constitution as "the superior leading force of society and of the state," determines content and editorial tone, resulting in almost complete uniformity across all broadcasts and publications. Independent journalists face censorship as well as detention and harassment by state security. Similarly, the government limits access to the Internet to a small number of professionals and party faithful and employs monitoring and blocking technologies to further restrict freedom. Cuba estimates that 14% of its population has access to the Internet; international estimates are lower, making Cuba among the least-wired countries in the world. Authorities have used surveillance, short-term detentions, and state-organized mobs to interfere with unauthorized meetings and public demonstrations. 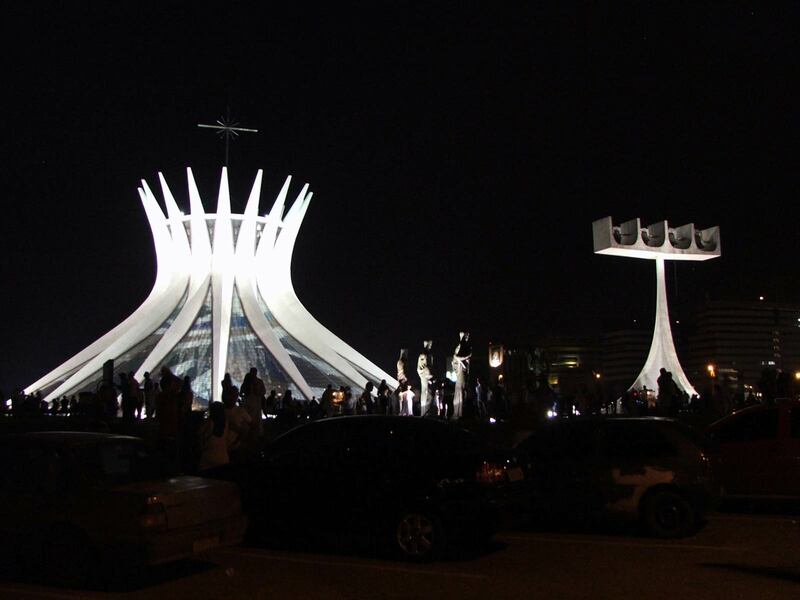 Civil society groups have reported dozens of cases in which state security and police prevented or broke up meetings using house arrests, short-term detentions, and checkpoints around planned meeting sites. The government also continues to regularly employ organized mobs to humiliate opponents and interfere with peaceful assemblies. Although the government characterizes counter-demonstrations as spontaneous, participants arrive in government buses and openly coordinate with state security officials. The government also restricts freedom of movement, both domestically and internationally. Cubans must obtain permission to change their place of residence and can be forcibly returned to their home province if they are illegally resident. This law is most commonly employed in the capital, where thousands of people reside illegally and at least dozens are returned to the provinces on a weekly basis. For international travel to all destinations, Cubans must receive an exit permit. The Cuban Government routinely denies exit permits to political opponents and human rights activists. In addition to political opponents, the government will not grant an exit visa to some types of professionals (e.g., doctors, nurses, etc.) until they have worked in Cuba for a certain number of years after completing their education. In 2011, President Castro announced that travel restrictions would be loosened in the near future, but that restrictions would remain in place to prevent educated professionals and others from leaving the country. The Cuban Government routinely violates international labor standards. The law does not allow workers to form and join independent unions of their choice. All unions must be recognized and affiliated with the Central de Trabajadores de Cuba (CTC), or the Workers' Central Union of Cuba, whose leaders are chosen by the Communist Party. The CTC's principal responsibility is to ensure that government production goals are met. It does not bargain collectively, promote worker rights, or protect the right to strike. The government harasses, detains, and has imprisoned leaders of unauthorized labor movements. For additional information, see also the Department's Country Report on Human Rights Practices (http://www.state.gov/j/drl/rls/hrrpt/) for Cuba. With the loss of Soviet-era subsidies in the early 1990s, Cuba's armed forces have shrunk considerably, both in terms of numbers and assets. Combined active duty troop strength for all three services is estimated at 50,000 to 55,000 personnel (compared to some 235,000 on active duty 10 years ago) and much of Cuba's weaponry appears to be in storage. Cuba's air force, once considered among the best equipped in Latin America, no longer merits that distinction, though it still possesses advanced aircraft and weapons systems; the navy has become primarily a coastal defense force with no blue water capability. The Cuban army is still one of the region's more formidable, but it also is much reduced and no longer has the considerable resources necessary to project power abroad. Exchanges and visits with foreign military allies like Russia, China, and Venezuela have become common over the past few years. The military plays a dominant role in the economy, particularly in tourism, civil aviation, foreign trade, and retail operations. Cuba's National Civil Defense, responsible for preparing for and responding to natural disasters and oil spills, is also under the Ministry of Armed Forces. The country's two paramilitary organizations, the Territorial Militia Troops and the Youth Labor Army, have a reduced training capability. Cuba also adopted a "war of the people" strategy that highlights the defensive nature of its capabilities. In this respect, and despite the drain on the country's resources, the government has continued to hold national military drills in preparation for hypothetical military aggression from the United States. The government continues to maintain a large state security apparatus under the Ministry of Interior to repress dissent within Cuba. Real gross domestic product (GDP) grew by 2.1% in 2010, according to official statistics. However, Cuba uses a unique "social" method for calculating GDP which makes its figures impossible to compare with any other country in the world. The reported growth reflected a slight improvement on the 1.4% growth in 2009 and 1.9% growth the Cuban Government had forecast for 2010. The Cuban Government continues to adhere to socialist principles in organizing its state-controlled economy. Most of the means of production are owned and run by the government and, according to Cuban Government statistics, about 83% of the labor force is employed by the state. An additional 5% of the labor force is employed by cooperatives closely connected with the state. Only 12% of the labor force works in the private sector, including private farmers, artists, and 142,000 self-employed ("cuentapropistas"), representing less than 3% of the entire workforce. More than 60% of the workforce is employed in non-productive sectors. The Cuban economy suffers first and foremost from a lack of productivity and an overdependence on the external sector. Cuba suffered a significant decline in gross domestic product of at least 35% between 1989 and 1993 as the loss of Soviet subsidies laid bare the economy's fundamental weaknesses. To alleviate the economic crisis, in 1993 and 1994 the government introduced a few market-oriented reforms, including opening to tourism, allowing some foreign investment, legalizing the dollar, and authorizing self-employment for some 150 occupations. These measures resulted in modest economic growth, although the official statistics are deficient and provide an incomplete measure of Cuba's real economic situation. From 2000 to 2009, Cuba experienced a series of severe economic disruptions, including lower sugar and nickel prices, increases in petroleum costs, devastating hurricanes in 2001, 2004, and 2008, a major drought in the eastern half of the island, increasing external debt, liquidity issues, and stagnant or decreasing agricultural and industrial productivity. Significant economic assistance from Venezuela, and to a lesser degree China, has helped keep the Cuban economy afloat. Living conditions in 2010 remained well below 1989 levels. Moreover, the gap in the standard of living is widening between those with access to convertible pesos and those without. Jobs that can earn salaries in convertible pesos or tips from foreign businesses and tourists have become highly desirable. Over $1 billion in yearly remittances exacerbates the gap. Prolonged austerity and the state-controlled economy's inefficiency in providing adequate goods and services have created conditions for a flourishing informal economy in Cuba. As the variety and amount of goods available in state-run peso stores has declined and prices at convertible peso stores remain unaffordable to most of the population, Cubans have turned increasingly to the black market to obtain needed food, clothing, and household items. Pilferage of items from the work place to sell on the black market or illegally offering services on the sidelines of official employment is common. A report by an independent economist and opposition leader speculates that more than 40% of the Cuban economy operates in the informal sector. In the last few years, the government has carried out an anti-corruption campaign, including the creation of a Comptroller General's Office, repeated street-level crackdowns, and ongoing ideological appeals. So far, these measures have yielded limited if any results. Fifteen years after the demise of the Soviet Union the Cuban Government found in Hugo Chavez's Venezuela a new benefactor. The politically motivated preferential relationships with this country have replaced tourism as the main engine of growth for the Cuban economy since the second half of 2004. Its main component has been the exchange of medical services for oil at indexed prices and with long-term financing of up to 50% at subsidized interest rates. The transfer of financial resources from Venezuela to Cuba has also materialized in credits for projects at concessionary interest rates, the creation of joint ventures and a large number of cooperation projects. As a whole, the preferential economic relationship with Venezuela has allowed the Cuban Government to more than double its import capacity, which had historically been closely related to GDP growth, and to carry out multibillion dollar investments both in infrastructure and productive sectors. This factor, together with almost tripled nickel prices in the world market between 2004 and 2008, explains the high growth rates registered in this period, but also allowed (now former) President Fidel Castro to start reversing some of the liberalizing and decentralizing reforms introduced in the 1993-2003 period. In his 2008 inaugural address, Raul Castro said the Cuban Government would "advance in an articulate, sound and well-thought out manner" a series of measures that would raise the Cuban standard of living and tie individual prosperity to individual initiative and work performance. Castro also referred to excess "prohibitions and regulations," the simplest of which the Cuban Government would start removing "in the next few weeks." Ever since, at every opportunity, Castro has emphasized the need, even urgency, of enacting economic reforms. Since 2008, the government has authorized private farmers to work small plots of fallow public land; eliminated some subsidies, including food rations and subsidized lunches in workplace cafeterias; allowed a limited number of traders to operate privately; allowed used cars to be sold; and expanded access to certain previously restricted consumer goods (like cell phones, computers, and home appliances), among other things. In April 2010, President Castro announced that there were more than 1 million "excess" workers in Cuba. In September 2010, the Cuban Government announced that more than 500,000 state workers, 10% of the workforce, would be laid off by the first quarter of 2011. To absorb these workers, the government said it would reduce regulations on private sector employment and expand the cooperative sector. In October 2010, the Cuban Government published new rules regulating the self-employment sector, including new activities (increasing the number of activities authorized to 178), opening the door for self-employed workers to hire labor, and introducing a new tax scheme to include taxes on sales, profit, payroll, and social security. By the end of 2010, the Cuban Government announced it had granted 75,000 new licenses for self-employment activities, which represented more than a 50% increase from the number authorized in 2009. In April 2011, the Communist Party held a party congress for the first time in 14 years, and endorsed reforms previously introduced by President Raul Castro. Most notably, these reforms included allowing the purchase/sale of private property and possible credit mechanisms for small businesses and cooperatives. In late 2011, the Cuban Government announced that it would allow the donation, sale, and purchase of homes for the first time since the early days of the revolution. The reality of economic reforms to date has not matched the government's urgent language, and the government has so far unveiled limited measures that have fallen short of true market liberalization. The government continues to hamper private sector growth with tight restrictions on the supply of goods and labor, high taxation that discourages hiring and profits, a ban on professional entrepreneurs, limited access to transportation and credit, a monopoly on importation, legal uncertainty and lack of transparency, and a host of other disincentives and restrictions. The reforms introduced so far, at a very slow pace, have been insufficient to reverse the deep systemic crisis first brought to light with the departure of Soviet economic support and exacerbated by a liquidity crisis that peaked in 2008-2009. Exports of professional services, mainly doctors and nurses to Venezuela, has been the main source of hard currency revenues for the Cuban economy since 2005. Sugar, which was the mainstay of the island's economy for most of its history, has fallen upon troubled times. In 1989, production was more than 8 million tons, but by 2009, it had fallen to barely one million tons. Inefficient planting and cultivation methods, poor management, shortages of spare parts, and poor transportation infrastructure combined to deter the recovery of the sector. In June 2002, the government announced its intention to implement a "comprehensive transformation" of this declining sector. Almost half the existing sugar mills were closed, and more than 100,000 workers were laid off. The government promised that these workers would be "retrained" in other fields, though it was unlikely they would find new jobs in Cuba's stagnant economy. The sugar sector has continued to decline since the restructuring, with output registering a downward trend and averaging just 1.6 million tons during 2003-2009. Tourism figures prominently in the Cuban Government's plans for development, and a top official casts it as at the "heart of the economy." Havana devotes significant resources to building new tourist facilities and renovating historic structures for use in the tourism sector. Roughly 1.7 million tourists visited Cuba in 2001, generating about $1.85 billion in gross revenues; by 2010 that number was 2.53 million, and had generated $2.4 billion. According to the Cuban Ministry of the Basic Industry (MINBAS), nickel became the leading export and the top foreign exchange earner in 2007. In 2009, world nickel prices generated $870 million. Cuba's pharmaceutical and biotechnology industry is another emerging sector, ranking third in foreign sales behind nickel and oil products, and ahead of traditional products such as tobacco, rum, and sugar. Exports of pharmaceutical and biotech products were between $300 and $350 million in 2007-2008 and jumped to $520 million in 2009. Remittances also play a large role in Cuba's economy. Cuba does not publish accurate economic statistics, but academic sources estimate that remittances total from $800 million to $1.5 billion per year, with most coming from families in the United States. U.S. regulatory changes in 2009 and 2010 allow unlimited remittances to family members and religious organizations. The total amount of family remittances that an authorized traveler may carry to Cuba is now $3,000. In January 2011, the United States announced further changes that permit anyone under U.S. jurisdiction to send up to $500 per quarter to someone in Cuba. The changes also authorize unlimited remittances to religious organizations in Cuba. In 2004, the government mandated that U.S. dollars be exchanged for "convertible pesos" or CUCs — a local currency that can be used only in Cuba and has no value internationally. The Cuban Government levies a 10% penalty on U.S. dollar exchanges that disproportionately affect Cubans who receive remittances from relatives in the United States. However, Western Union announced in December 2010 that it received permission from the U.S. and Cuban governments to remit payments in Cuban convertible pesos, thus avoiding the 10% surcharge. The Cuban Government captures these dollar remittances by allowing Cuban citizens to shop in state-run "dollar stores," which sell food, household, and clothing items at a high mark-up averaging over 240% of face value. To help keep the economy afloat, Cuba has actively courted foreign investment in targeted sectors. Although majority foreign ownership has been permitted since 1995, it has seldom been allowed. Foreign investment often takes the form of joint ventures with the Cuban Government holding half of the equity, management contracts for tourism facilities, or financing for agricultural crops. The number of joint ventures has steadily declined since 2002 to 218 in 2009. Moreover, a hostile investment climate, characterized by inefficient and overpriced labor, dense regulations, and an impenetrable bureaucracy, continue to deter foreign investment. In 2010, the government published a new law that extended the leases foreign investors could sign from 50 years to 99 years, exclusively for tourist properties, and said that it was in talks with international firms to build up to 16 new golf courses in 2011. None had moved forward by the close of 2011. Cuba's precarious economic position is complicated by the high price it must pay for foreign financing. The Cuban Government defaulted on most of its international debt in 1986 and does not have access to credit from international financial institutions like the World Bank. Therefore, Havana must rely heavily on short-term loans to finance imports, chiefly food and fuel, and structured financial instruments tied to more stable revenue sources (e.g., nickel, tourism, and remittances). Because of its poor credit rating, an $18 billion hard currency debt, and the risks associated with Cuban investment, interest rates have reportedly been as high as 22%. Cuba has an activist foreign policy and aims to find new sources of trade, aid, foreign investment, and political support, as well as to promote opposition to U.S. policy toward Cuba, in particular U.S. trade sanctions. Cuba has relations with over 160 countries and has civilian assistance workers — principally physicians and nurses — in more than 20 nations. In 2009, Costa Rica and El Salvador re-established diplomatic relations with Cuba. Since the end of Soviet backing, Cuba appears to have largely abandoned monetary support for guerrilla movements that typified its involvement in regional politics in Latin America and Africa, though it maintains relations with several guerrilla and terrorist groups and provides refuge for some of their members in Cuba. 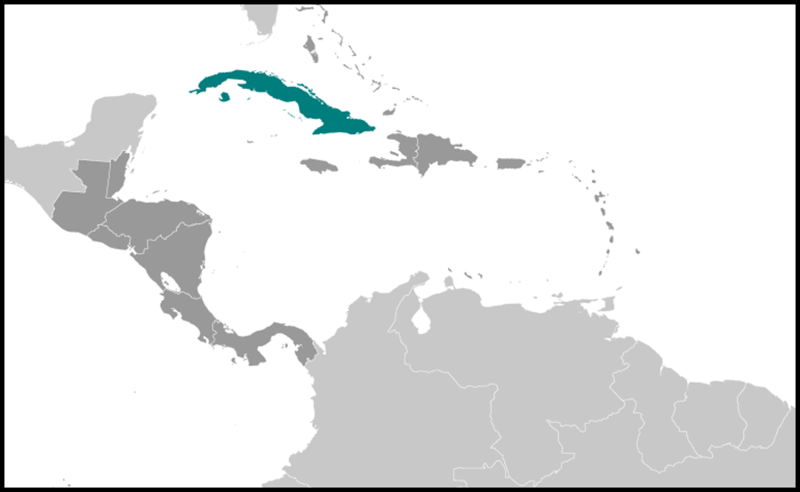 Cuba's support for Latin guerrilla movements, its Marxist-Leninist government, and its alignment with the U.S.S.R. led to its isolation in the hemisphere. Cuba was readmitted to the Organization of American States (OAS) in 2009, after having been expelled in 1962, but Cuba has refused to rejoin. Cuba hosted the Non-Aligned Movement (NAM) summit in 2006 and held the NAM presidency until 2009. Throughout the 1970s and 1980s, Cuba expanded its military presence abroad, spending millions of dollars in exporting revolutions; deployments reached 50,000 troops in Angola, 24,000 in Ethiopia, 1,500 in Nicaragua, and hundreds more elsewhere. In Angola, Cuban troops, supported logistically by the U.S.S.R., backed the Popular Movement for the Liberation of Angola (MPLA) in its effort to take power after Portugal granted Angola its independence. Cuban forces played a key role in Ethiopia's war against Somalia and remained there in substantial numbers as a garrison force for a decade. Cubans served in a non-combat advisory role in Mozambique and the Congo. Cuba also used the Congo as a logistical support center for Cuba's Angola mission. In the late 1980s, Cuba began to pull back militarily. Cuba unilaterally removed its forces from Ethiopia, met the timetable of the 1988 Angola-Namibia accords by completing the withdrawal of its forces from Angola before July 1991, and ended military assistance to Nicaragua following the Sandinistas' 1990 electoral defeat. As a result of the 2003 crackdown on dissidents, the EU adopted a Common Position on Cuba to leverage cooperation to demand greater respect for human rights and encourage government reforms. The EU remains divided on the Common Position, with many members pushing to replace it with a bilateral agreement that includes human rights provisions, a shift that the Cuban Government has lobbied for. Canada maintains a robust trade and investment relationship with Cuba, with a large presence by the Canadian mining firm Sherritt Corp. Some Sherritt operations take place on property confiscated from American investors, subjecting officers of Sherritt to Libertad Act sanctions. Canada is also the largest source of foreign tourists who visit Cuba each year, reaching nearly one million visitors in 2010, representing 37% of total visitors. Spain is among the most important foreign investors in Cuba. Spanish economic involvement with Cuba is primarily centered on joint venture enterprises in tourism. Spain and Canada alternate as Cuba's third- and fourth-largest trade partners behind Venezuela and China. Cuba's bilateral relationship with Venezuela has helped keep the Cuban economy afloat. The "Integral Cooperation Accord" signed by Fidel Castro and Venezuelan President Hugo Chavez in 2000 laid the groundwork for a quasi-barter exchange of Venezuelan oil for Cuban goods and services that has since become a lifeline for Cuba. For Cuba, the benefits of the cooperation accord are subsidized petroleum and increased hard currency flows. The original agreement allowed for the sale, at market prices, of up to 53,000 barrels per day of crude oil and derivatives (diesel, gasoline, jet fuel, etc.) by PDVSA, Venezuela's state-owned petroleum company, to its Cuban counterpart, CUPET. The number of barrels of oil Venezuela began selling to Cuba has risen to over 90,000 barrels daily. Under the accord, PDVSA extended preferential payment terms to CUPET, including 90-day short-term financing instead of the 30 days offered to its other customers and, in lieu of a standard letter of credit backed by an international bank, PDVSA accepted IOUs from Cuba's Banco Nacional, the central banking entity responsible for servicing Havana's foreign debt. In August 2001, Venezuelan President Hugo Chavez amended the 2000 accord to allow Venezuela to compensate the Cuban Government in hard currency for any and all Cuban products and services originally intended as in-kind payment for Venezuelan oil. As a result, Cuban exports of goods and services to Venezuela climbed from $34 million in 2001 to more than $533 million in 2009. Venezuelan ministries are contracting with Cuba for everything from generic pharmaceuticals to pre-fabricated housing and dismantled sugar mill equipment. In 2009, Venezuela sent more than 115,000 barrels of oil to Cuba. A series of economic agreements between Cuba and China have strengthened trade between the two countries. Sino-Cuban trade totaled more than $1.69 billion in 2009, according to Cuban Government numbers. Most of China's aid involves in-kind supply of goods or technical assistance. In 2009, China announced $600 million in loans and agreements. The agreements included a $260 million loan to purchase 10 bulk carriers, $300 million to improve Cuba's telecommunications network, $9 million for Cuban television, and a $1 million line of credit for Cuban-determined projects. Following a 2006 visit by the Russian prime minister, Russia set aside, for the moment, more than U.S. $20 billion in Soviet-era debt, restructured post-1991 debt, and extended a new credit line to Cuba. The new credit line was for U.S. $355 million repayable over 10 years at an interest rate of 5%. The new credit was conditioned in that it must be used to purchase Russian cars, trucks, and planes, as well as to finance Cuban energy and transport infrastructure projects, including air navigation systems. Russia further agreed to restructure U.S. $166 million in debt accumulated since 1993. Both nations also signed an agreement on military equipment and technical services. Raul Castro made a state visit to Russia in 2009 during which several additional trade agreements were signed. U.S. policy toward Cuba is focused on encouraging democratic and economic reforms and increased respect for human rights on the part of the Cuban Government. President Barack Obama has taken several steps to reach out to the Cuban people in support of their desire to freely determine their country's future. In April 2009, the United States announced the lifting of restrictions on family travel and remittances to Cuba, expanded the list of items eligible for humanitarian export to Cuba, and announced new regulations for U.S. telecommunications companies to expand the flow of information to Cuba. In January 2011, the United States announced regulatory changes that increase purposeful travel including religious, cultural, educational, and people-to-people travel; expand the individuals and groups eligible to send and receive remittances; and allow all U.S. international airports to apply to provide charter services to Cuba (previously only three airports were authorized). Though Cuba is subject to trade sanctions, the United States remains Cuba's largest source of food and humanitarian aid. The United States is committed to supporting safe, orderly, and legal migration from Cuba through the effective implementation of the 1994-95 U.S.-Cuba Migration Accords. Travel to Cuba is restricted by U.S. regulations to licensed travelers engaged in a set of specified activities. All U.S. travel to Cuba must be licensed by the Department of Treasury's Office of Foreign Assets Control consular information (OFAC), and must fall into one of 12 categories. Further information on the licensing process can be obtained from OFAC or at its website (http://www.treasury.gov/about/organizational-structure/offices/Pages/Office-of-Foreign-Assets-Control.aspx) website. Those contemplating a visit to Cuba should consult the (http://www.travel.state.gov/travel/cis_pa_tw/cis/cis_1097.html) about the country. All exports to Cuba must also be licensed by the Commerce Department's Bureau of Industry and Security (BIS). Further information on exports to Cuba can be found at the BIS (http://www.bis.doc.gov/). The U.S. Interests Section (http://havana.usint.gov/) is located at Calzada between L & M Streets, Vedado, Havana, switchboard: (53-7) 33-3551-3559, fax/general: 33-3700; Public Affairs: 33-3967, fax: 33-3869; hours: 8:30 a.m. to 5:00 p.m. Emergencies/after hours: 33-3026.